From a homeless man to a factory worker, from a hilarious funeral speaker to a broker, tattooed punk, scientist, puppeteer, conservative mother with family, choreographer, newsreader and reporter, all these mentioned personalities you will see in the super intellectual MANIFESTO from the acclaimed visual artist Julian Rosefeldt. He chooses, edits and ressambles thirteen artist’s manifestos into one movie, where Cate Blanchett, through her tour-de-force performance brings to life the ideas of Claes Oldenburgh, Yvonne Rainer, Kazimir Malevich, Andre Breton, Sturtevant, sol LeWitt, Jim Jarmusch, and many more. MANIFESTO begins with the prologue of The Communist Manifesto, the 1848 political pamphlet by German philosophers Karl Marx and Friedrich Engels. Then, a homeless man reads the manifestos of Situationism from Lucio Fontana, John Reed Club of New York, Guy Debord, Alexander Rodchneko and Constant Nieuwenhuys. After that, the viewer takes a trip to the world of Broker, again, to state an art. But the most amusing and absolutely relevant, frankly all of them were, are the ones you will hear from Tattooed punk, Choreographer, newsreader and reporter. As the story unfolds, you will most likely, appreciate everything around more than you did before. Its artistic nature is delicately staged with mind-blowing decorations and you will learn that art is not only what you see in the museums, art is everything you see around: the flowers, the green grass, leaves, trees, even the work you do. Art is even when you throw your garbage away and it doesn’t matter how you do that. But that is the least you will have to prepare yourself, as this movie is not meant for an average viewer but only for those who realize the true origin of art and its ability to recognize it. In conclusion, Julian Rosefeldt’s MANIFESTO is a brilliantly written and directed movie. It’s intelligent, thought provoking and something you should never stop watching. It’s superbly and flawlessly performed by chameleonic Cate Blanchett, who seems was created and brought to this life by the God of Acting. What she does or doesn’t in this film is hard to describe. It’s unreal, applaudable and something that will be studied by many students. 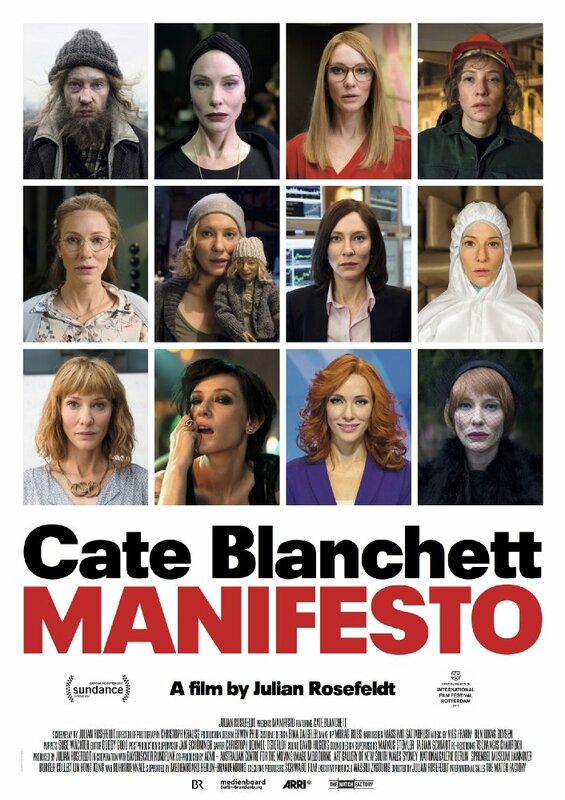 If this movie is about the art of everything, Cate Blanchett brings her own manifesto, creates her own art of acting, showing that nothing is impossible, nothing is original, unless you bring something of your own to be as an example the way she is….